It’s the first day of spring and the Vernal Equinox so time to take a review back over the winter. It’s been a quiet time online for Achray Farm, but with exciting news to share very soon. Being outside most of the year gives us the personal validation that the Trossachs is a great place to live in or visit all-year-round. We have opened up our booking window for The Old Farmhouse for others to enjoy too. There is even a Christmas slot available for a last-minute escape to the country. The end of this month (November 2018), marks our second anniversary at Achray Farm. When you live and breath a place, change can be hard to see on a daily basis. It’s only when friends pass by after a couple of weeks away and comment, or an image on the phone or Facebook pops up as a memory that brings it home. * With apologies to Crowded House. One of our aims for Achray Farm was to create a regenerative environment. This tenet is not only in what we produce (see Blog from April 2018), but also in how we operate on our triple-bottom line of Financial, Social and Environmental impact. One of the biggest environmental aspects outwith our direct control is the power and heat used to supply the domestic residential, guest accommodation and operations on the farm. Although we currently utilise a “green” tariff with our energy supplier we knew there was more potential and opportunity with the space and environment to do more. In late 2017 we began investigation into integrating a local district heating system for the buildings under current (and future) development and solar to use our own power on-demand and supply a little back to the grid. Although we considered geothermal, the risks of shallow arrays in our stony glacial till and the costs of deep bores brought us to more conventional solar and biomass combination. Solar power in Scotland? That sounds like growing grapes and sweetcorn here but there are now large-scale subsidy-free commercial developments and panels that work well under a range of conditions, including direct sunlight (and there are even sweetcorn and grapes growing in Scotland now as well!). Even with these, typically East coast, developments The Trossachs is not seen as a primary or high solar gain area. However, being able to optimise a ground-mounted array with unrestricted orientation and alignment, when the sums were presented the long-term financial balance along with the improved environmental impact of the farm as a whole allowed us to progress. As it turns out, 2018 has been a phenomenally sunny year since May, making up for the long cold winter. We passed our first tree saved, have hit a couple of 30KWh days and even reached 1MWh in less than 2 months. Some modern offshore wind turbines can generate a MWh in around 10 minutes under good conditions, but I am very pleased by our performance from late April to June. We have also installed an ImmerSun immersion control to maintain our hot water tank temperatures by scheduling hot water during the day to use our own power first before the biomass system needs to fire up. Our biggest investment, and biggest capacity to control our impact and energy security is the biomass infrastructure. 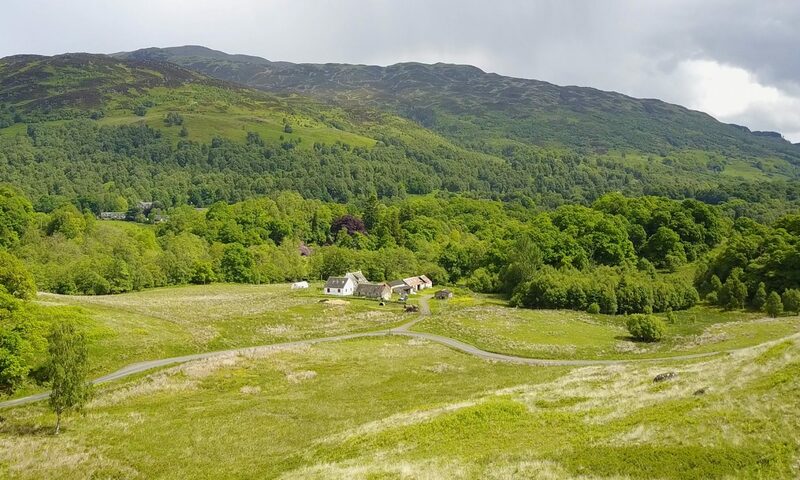 There is a lot of discussion in relation to biomass as an environmental level, but living in Scotland, surrounded by commercial forestry that creates local by-products and sourcing local suppliers. Now, after construction of a new building, built to fit into the listed building environment, hand digging deep trenches, the installation of a new boiler and accumulator with enough pipework to make an almost sculptural engineering work of art contorted into the space. All this is supplied by a 9-ton pellet store and automated auger feeder. When filled up in the autumn (no seasonal price differences in pellet supply) this should be able to readily last us through the winter and icy/snowy forest roads that can prevent heavy deliveries for months at a time. Pellet supply from BD Supplies was efficient with advice and a clean delivery, weighed to the Kg. Our main energy contract suppliers, Mike and Dave from Energy Source (UK) have throughout been professional, friendly and flexible in designing, installing and commissioning our solution. It’s been snowing overnight again and we have wintry showers and low temperatures forecast all week. But at the same time, we are now almost four weeks after the shortest day and the change in light and routine times have started to move as well. As a schoolchild and student (for quite a long time) I always walked or cycled every morning and evening. When you are part of the environment you understand the difference between a cold day and a mild one and the changing of the seasons are tangible on a daily basis. Then for a long time I would, as many do, traverse from a heated home to a car or public transport, to office and then reverse again, possibly via a convenient and climatically controlled store for food. Now we live in an environment that requires a pre-dawn outing to feed and water animals. The difference in a few degrees between frost and thaw can make a big difference in delivering fresh water from frozen pipes and it is easy to feel how a damp wind chills so much more than a much colder dry clear night. We know where to look for beautiful hair ice and have found scarlet elf’s cap fungi in the fallen deadwood. But apart from the temperature, we are also experiencing the light. The hen’s automated door-timer has already been moved on 10 minutes as on a clear evening the birds were still mooching around at 5pm. And although I can see that sunrise is at around 8:40, an hour beforehand I can just about find my way to the pig feed without a head torch now. In a week or so the sun will no longer catch the top of the trees as it passes over Creagh Dbuh in the early afternoon and more warmth and life will reach the fields, their plants and animals and those working in them. In the coming months we will see spring closer than ever before, with first hand engagement in our new hedgerows, trees and perennials – looking for the first unfurling and re-greening of the land. A few years ago on the radio I heard one of my favourite words that I now get the chance to write down. Phenology is “the study of periodic plant and animal life cycle events and how these are influenced by seasonal and interannual variations in climate“. I look forwards to understanding the seasons here by experience and interaction, but for now I need to dig some chickens out of a snow drift.